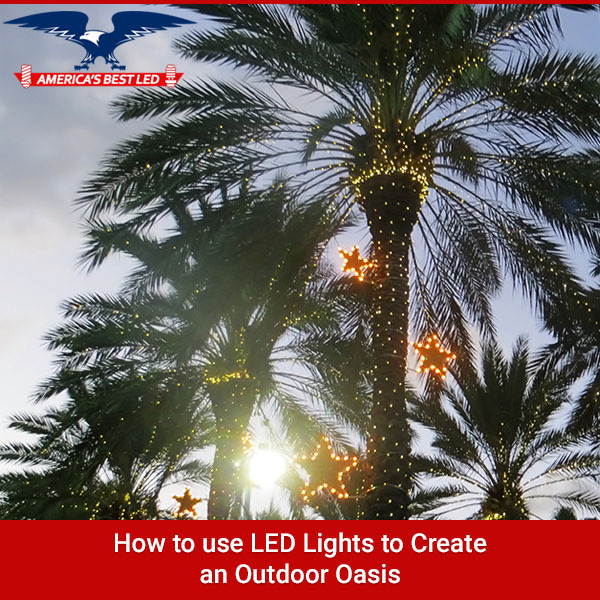 When you’re ready to truly spruce up your yard, especially for those hours after the sun has gone down, you’ll want to consider installing some LED lights throughout your property. Doing so will give it a new life at night and some of these tips and products are brilliant. You can highlight the parts of your yard that you’re the proudest of (e.g. plants, trees, bushes, statues). LED landscape spotlights emit a variety of powerful shades of light – even RGB color-changing illumination. These have an adjustable base or ground stake so you can easily aim them at an object. Simply plug them in, point them where you want to go and enjoy. For a brighter, wider option (something that’ll cover a large area), consider flood lights instead. They’ll do the same thing, just on a broader spectrum. There’s also landscape well lights available for an even smaller option. These are perfect for illuminating trees from below or adding some lighting to a path, mulch bed, garden, or deck. Your deck has many places where you can add a touch of light. There are many different types of lighting you can add there too – including eyelid, strip, recessed, and outdoor step lights. Adding these lights in, on, and around your deck will brighten it up, make things more visible, and add an upscale, decorative touch. When you want to add light to your rail or steps, you should use strip lights because they’re flexible, weatherproof, and waterproof. They’re available a variety of colors and intensities so you’re bound to find the right LED lights for your ambiance. Another great option is eyelid lights for surface-mount options. You can then aim their illumination downward where you need it the most. Recessed step lights are available in both round and square shapes. They also have various faceplate styles and colors so you can find LED lights to match your deck. Pathway lights are a functional way to make your yard look better. You can also use these around your driveway and in a garden or a mulch bed. This is because there are a variety of decorative styles like pagoda, copper, bollard, mushroom, and others. There are many creative ways you can use LED lights to light up any path. For instance, you can add these lights inside of your stone retaining walls, place them underneath stone blocks, or put them under stone pavers. From any of these locations your lights will emit your choice of a cool, natural, or warm white light in your choice of 7, 12, or 18-inch lengths. In other words, you can find an option that’ll fit in any area you want to use them in. Of course, you don’t have to simply use these lights in only these areas either. You can also use them for lighting up your deck or underneath your deck railing. Think about how you can use LED lights underwater, around ponds, and in fountains so you can enjoy watching your fish swim at night. Here you also have the option of using either single or multicolored illumination. This can create a relaxing, enjoyable getaway for you when you need it. Clearly you can see that when you choose to use LED lights for landscape lighting your options are truly limitless. Over the years we’ve seen these lights used in so many different and fascinating ways. Give us an opportunity to help you explore some of these options, contact America’s Best LED today. We look forward to helping you create a beautiful landscape for your home.